Snobby Tours Travelblog: Versailles Palace to have luxury hotel on grounds; overnight guests will stroll in gardens for first time in 300 years. 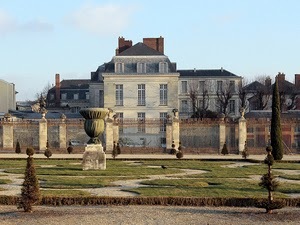 Versailles Palace to have luxury hotel on grounds; overnight guests will stroll in gardens for first time in 300 years. "If you've ever dreamed of spending the night at the Palace of Versailles, you might get your chance. A building at France's cherished cultural landmark will soon be turned into a luxury hotel. "Home to the French monarchy since Louis XIV, Versailles is a monument to royal grandeur. Soon, the palace may also become known for its five-star hotel. "Mikael Hautchamp is the deputy administrator for the Palace of Versailles. He opens the front doors to the future luxury lodging, a grand, but dilapidated mansion about a hundred yards from the main palace. "Known as the Hotel du Grand Controle, the mansion was built in the 1680s to serve as the offices and home of the king's treasurer, where he lived with his family and servants. The Hotel du Grand Control was evacuated, along with the rest of Versailles, during the French Revolution. In the 19th and 20th centuries it fell into further disrepair. "Hautchamp says Versailles doesn't have the $7 million it will take to restore the building, which is why it turned to Belgian hotel company Ivy International. The company will renovate the mansion and turn its 23 bedrooms into a luxury hotel. "A percentage of the profits will be paid back to the Palace of Versailles in rent. The restoration is the first in a series of commercial projects aimed at saving French monuments. "Visitors will have chance to see what it felt like to live at Versailles. "The Orangerie is the greenhouse where Louis XIV stored his 1,700 orange and palm trees throughout the winter months. The restoration of the Hotel du Grand Controle will take place in 2011 and be overseen by France's top historical architect.
" 'It's quite a pioneering initiative in France for somebody to be able to have the right to take on a project like this in such a historic momentum and transform it into an economic project,' says Louise Grether, who manages the project for Ivy International. "Some have been critical about handing over a national treasure to a private operator. But on the streets of Versailles, people seem fine with the idea. "Near the palace, bookshop owner Serge Bessiere says he thinks the new hotel will be a fabulous place to stay, and celebrate any occasion. 'Louis XIV never stopped throwing sumptuous feasts and parties to show he was the Sun King . . ' Bessiere says. "In January 2012, when the Hotel de l'Orangerie is completed, overnight guests will be able to drink champagne and stroll in the gardens of Versailles for the first time in 300 years." Snobby Tours®, Inc. is looking forward to checking this out the next time we bring a tour group to Paris. We have mixed feelings about turning over historic national treasures and monuments -- and even antiquities like Pompeii -- to private/corporate operators; however, we recognize that the cost of maintaining these sites for posterity is often too prohibitive to rely solely upon governmental resources.